Heroic realism is a term which has sometimes been used to describe art used as propaganda. Examples include the Socialist realism style associated with Communist regimes, and sometimes the similar art style associated with Fascism. Its characteristics are realism and the depiction of figures as ideal types or symbols, often with explicit rejection of modernism in art (as "bourgeois" or "degenerate"). Both socialist art and Nazi art were explicitly ordered to be heroic, and were in consequence ideal rather than realistic. 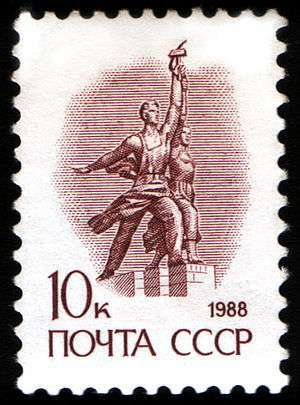 Heroic realism designs were used to propagate the revolution in the Soviet Union during Lenin's time. Lenin doubted that the illiterate population would understand what abstract visual images were intended to communicate. He also thought that artists, such as constructivists and productivists, may have had a hidden agenda against the government. Movements such as Cubism were denounced as bourgeois and criticized for its failure to draw on the heritage of art and for rejecting the beautiful on the grounds that it was "old", whereas proletarian culture had to draw on what was learned in the prior times. The artists countered such thinking, however, by saying that the advanced art represented the advanced political ideas. Stalin understood the powerful message which could be sent through images to a primarily illiterate population. Once he was in power, posters quickly became the new medium for educating illiterate peasants on daily life—from bathing, to farming, the posters provided visual instruction on almost everything. In 1931-2, the early emphasis on the "little man" and the anonymous laboring masses gave way to the "hero of labor", derived from the people but set apart by the scale of his deeds. As a consequence, literature filled with "positive heroes" that were sometimes tedious. When Adolf Hitler came to power in Germany in 1933, modern art was condemned as degenerate, and largely prohibited. The Nazis promoted a style of art based on classical models, intended to nurture nationalism. Heroic realism was to inculcate values of sacrifice, duty, and devotion. The heroic man, who was bound to blood and soil, acted rather than thought and sacrificed himself. This particularly favored the heroic death. 1 2 Susan Sontag,"Fascinating Fascism"